Pyrus Calleryana Winter Glow, often referred to as the 'evergreen ornamental pear', In reality it is a semi-deciduous form. Loosing some, but not all, winter foliage. It is often a popular screening variety as it holds leaves well into late winter, with only a brief period of dormancy. Actually in warmer climates it will hold the leaves through out winter, hence the evergreen pear label. A superb feature tree that at maturity will reach 8-10mt tall and 6-8mt wide. Glossy, green foliage turns a beautiful, flame red in autumn and by early spring, pink-eyed, white blossoms appear. This is a hardy variety with great, ornamental features throughout much of the year. 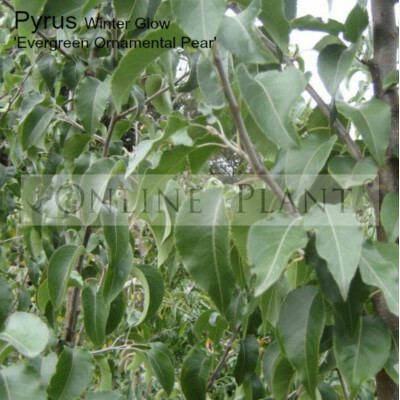 Buy Pyrus Calleryana Winter Glow Evergreen Pear Plants from Online Plants Melbourne. Australia's largest online retail Nursery. Over 3000 species of plants. Deliveries to VIC, NSW, ACT, QLD & SA.